Getting good beer in Norway is hard, but possible; getting well-tempered beer in Norway is nearly impossible, unfortunately. Most pubs and bars will serve the beer at refridgerator temperature, which ranges from too cold to much too cold. The problem with this is that the taste of the beer is subdued, which means that a lot of the more subtle flavours become impossible to detect, and the main flavour is weaker. To normal people this probably makes me sound like a real beer snob, and that's what I used to think myself a couple of years ago when I heard people talking about the importance of getting the temperature right. At the same time I used to notice that the same beers would sometimes have lots of flavour, and sometimes next to none, and I couldn't work out why. Eventually I realized that a lot of it had to do with the temperature. If you serve the beer too cold it will "flatten" the taste, and make the beer seem boring. The effect is strong enough that I think anyone who really pays attention to the aroma and taste will notice it. So what's the right temperature, then? Well, normal people don't put thermometers in their beer, and in this respect I am decidedly normal, so I won't give you a number in Celsius. The rule of thumb in the beer community is that the beer should be at cellar temperature. This means noticeably warmer than in your fridge, and noticeably colder than room temperature. Letting the beer wait for 20 minutes after you take it out of the fridge works for me. But what about if you get it served in a pub? I usually feel the glass with my hands. If it feels gently cool it's about right, and if it feels freezing cold I'll start ordering the next beer early so that it gets some time to heat up. Of course, being impatient I usually try to speed the process up by heating the beer with my hands. My girlfriend teases me for this, and keeps saying she's going to buy me a beer heater for Christmas. I've been thinking about this, and a beer heater strikes me as an excellent idea. I'm thinking that the perfect design would be something like the Guinness surger (review), but using microwaves for heating instead of ultrasonic waves for releasing bubbles. The trick is to come up with a device that doesn't have to enclose the beer, but still heats only the beer, and not the drinker. I'll leave it for real engineers to figure out how to do that. In the meantime, I think it's worth the effort to pay a little attention to the temperature of your beer. And needless to say, Guinness Extra Cold is for people who don't actually like Guinness. So, what is the right temperature in deg. F? I have to know the digits -- unless my brain sees the numbers, I cannot tell if something is cold enough or not. Thank you! Firstly, Guinness is not real beer. Real beer has Carbon dioxide not nitrogen. I like to group Guinness with those girly fabricated pre mixed drinks. Almost like a swedish (fake) cider. Beer should be served cold, the colder the better, straight out of the ice box at 0-4 degrees C.
Over here in Australia we invented devices to help your beer stay cool during hot weather. Have you ever been in temperatures over 45 degrees with 100% humidity. Let me tell you that if you cracked a beer at 13 degrees C that within 10 minutes it would be closer to 30 degrees than 13. That's why it's served cold, and we've gotten used to it. In singapore they serve beer in a glass filled with ice, because nobody wants to drink beer at 30 degrees C.
I would consider Guinness real beer, since it's produced by fermenting malts. But by CAMRA's (the British Campaign for Real Ale) definition of real ale, it's definitely not real ale. But beer and ale are not the same thing. I can see why you would want to adjust my serving advice above when serving beer outdoors under extreme climatic conditions. :-) As you hint, it's not really the temperature of the beer when you pour it into the glass that counts, but the temperature of the beer when you drink it. And that will of course change over the time you spend drinking the beer. But to drink the beer at 4 degrees doesn't work for me. That would have to be a beer I didn't like, and in that case I should be drinking water instead. I couldn't agree more with you - most beer is served too cold. Cellar temperature I think will be 7-8 degrees and refers to a typical soil cellar. "Guinness Extra Cold is for people who don't actually like Guinness." That had me rolling! It's so true! A pilsner? Sure, that can be served @ 7-10�C. But anyone who loves Stouts and Porters should know that they are best served around 18-21�C, which is ~65-70�F. (sorry, I'm a yank. hope the �F to �C conversions are right) Personally, I enjoy my porter at room temp 24-25.5�C (75-78�F). Guinness can rot. It's to Stouts what Budweiser is to Pilsners. An embarrassment. I was born in a brewery, my family has been 150 years in this business. 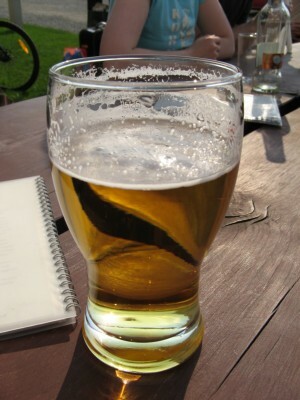 The right temperature for light beer as Pilsner, is 5 to 6' Celsius or 41 to 43 Fahrenheid. Guinness can be served at a little lower temperature. Dark beers are at 6 Celsius or 43 Fahrenheid right. It is frustrating to get an ice-cool lager in many restaurants, as it can't devellop a taste, it's "bad taste" English bitters and dark beers are serverd too warm in the summer months. They don't have the tradition of cool storage, as we on the continent. To get the best taste of a good lager, rinse the glass with water first, then pour in at the right temperature. Cheers! Different beers are better served at different temperatures. More often than not, the darker the beer or higher alc, the higher temp it can be effectively served at.some exceptions include IBA, bock beers or dunkel weissens. Higher alc beers also can tolerate and sometimes require slightly warmer serving temperatures, for the best experience. Flavours and aromas tend to get trapped in the beer at colder temperatures.As the beer 'warms', the flavours and aromas change somewhat. Try it next time you get a good quality craft beer. Not talking about the mass produced stuff like Bud or Asahi super dry (over here in Japan) - with those beers, they almost need to be served very cold, as when they 'warm up' they taste even worse! Some say a test of the around 5% alcohol beer quality is if you let it warm a little, can you still drink it? Ales are traditionally served at cellar temps. Weissens also should be served cool or cold for the best impact. The Japanese/American/Australian lagers and pilsners were perhaps designed with cold temps in mind. They benefit with a crisp taste from the cold temperatures and become more refreshing when chilled. Pale ales, barley wines, IPAs, should served warmer, to allow the complex malt flavours and characteristics to be fully appreciated. In Japan, they often serve everything at 3or4C. One bar here actually is devoted to Urquel and serves it at around 9-10C and displays on it's website the current temperature of the beer. Fantastic! It's no wonder they serve the best urquel in the country. At another bar, I ordered an English honey ale and it came in a frozen glass, with a huge block&#12288;of ice inside and a big chunk of lime on the glass! WTF?&#12288;Completely ruined the beer's flavour, carbonation, everything. I've also tried a beer that was in a glass full of cie and it's nasty stuff, though I'm not sure if I'd prefer a beer that was 30C or warmer - then it comes down to personal choice. I suppose this question is always gonna be a personal choice but to really get the best out of the particular style, in terms of flavour and appreciation, the beer should be served at the right temp. Colder for pislners, lagers and the mass produced cheap stuff. Cool r cold for weissens, ciders and some pilsners and perhaps American IPAs and German bocks. Cellar temps for British beers including ales, IPAs, brown ales, amber ales, pale ales, etc. Also cellar or possibly room temp for barley wines and DIPAs and stronger beers. I also often hold my pint in both hands to help warm the thing up as in Japanese almost every time, the beer is served in great condition apart from it's too bloody cold! Quite a few bartenders now apologise to me for the temperature. Most Japanese still want chilled beer, regardless of style. The majority demand gets to influence condition. It's a slow process, educating the masses. Whatever temperature you enjoy you beer at, I think the key point is that you enjoy your beer. If my friends wants to freeze his brown ale and likes it that way, I try to not worry too much. Here's hoping you ALL enjoy your beer! WRT most beer and certainly any good ale, cellar temp is the best. But, WRT Guinness, you are WAY oFf mark. It is designed (brewed) to be had cold. There is no ambiguity here. Almost every pub in Ireland (including the rooftop pub at the Guinness brewery) have two Guinness taps � cold and extra cold. Cold is about the same temp beers are served in the U.S. Extra cold is tooth chilling. Guinness and the Irish are so insistent that it is had cold, that extra cold is for those who like to nurse a beer and want it to be cold to the last drop. Even in England, in all pubs, the beers are served cellar temp. Guinness is served very cold. Simply, if a beer does not taste good at cellar temp, it is not good beer. Guinness, though, is the exception. Simply put, it's the only good beer - great beer - that tastes best cold. It is brewed with this in mind. So drink great beer and drink it cellar temp. But if you want a real cold great brew, drink Guinness - my favorite beer. If you think that people who drink Guinness cold don't like Guinness, you better tell Guinness and every Irishman that! I'm currently trying to figure how to get my .75L Oude Gueuze Tilquin bottle in the right temperature. So leaving it, from the fridge, out in normal room temperature for 20 minutes should do it, you say? Since it is a bigger bottle, maybe 25 minutes. In reply to Steffen's comment about British bitters and dark beers being served too warm in the summer months, I would suggest that he has visited the wrong pubs! I have worked in the pub trade for over 20 years and most cellar temperatures should be between 6 and 8 degrees (even in the summer) while coolers ensure that serving temperatures are the same. This standard has been set and regularly accredited by Cask Marque, a non-profit organisation which was set up to improve standards in the cask beer community (and no I don't work for them, I currently live in Tokyo, Japan!) In future if you want a decent pint in the UK during the summer months (and lets face it, it doesn't get too hot over there!) I recommend looking for the cask marque plaque at the pub entrance or POS.